Started in 2002 by Chris Johnson, LiveWatch has quickly become one of the most popular and affordable security monitoring systems. Their Plug&Protect system is one of the most flexible options on the market, not just because it allows you to choose various customization options, but also because you are allowed to try the system for an entire year. At any point within the first year you can return the equipment and receive a full refund. It’s clear LiveWatch has their customer’s best interests at heart. Most companies require a minimum three-year contract, but LiveWatch only requires one. Unlike other companies, they also allow customers to cancel service before the contract is up, without paying early termination fees. You can use the systems LiveWatch provides, although they come with a high up-front cost, or use an old system you have at home and only pay for the monthly cost. Either way, installation is DIY, which helps save on costs, although there is a small activation fee. Like many modern companies they are 100 percent wireless and offer various monitoring and control options through mobile devices. Even the most basic option allows you to turn off false alarms from your phone or signal for help. LiveWatch is one security monitoring company that is centered on customer needs, which is reflected in its policies. Although most companies try to lock customers in with long contracts, LiveWatch’s minimum contract is one year. Even so, they allow users to terminate early without paying the hefty fees other companies require. To top it off, LiveWatch has a ridiculously long trial period. Although most companies only offer a trial period for a matter of days or up to a month, you can return the monitoring system any time in the first year with LiveWatch to receive a full refund. Monthly pricing is comparable to other top security companies, and can be even cheaper. However, if you are buying the entire monitoring system up-front, costs can be considerable. However, LiveWatch demonstrates its customer friendly side again by allowing you to use your own security monitoring system if you have one. This will considerably save on costs. Consumers love their self-installation systems, which are also relatively easy to set up and install. However, if you aren’t tech savvy LiveWatch may not be for you. Professional installation isn’t an option. Despite the potential for more costs initially, their systems are also some of the best on the market. When an alarm goes off, the time they take to contact you averages less than 30 seconds, making their alerts some of the fastest out there. The fact that they provide security monitoring to more than 200,000 people, but have only received 17 complaints from the Better Business Bureau in the last three years says a lot about the quality of their service and customer satisfaction. 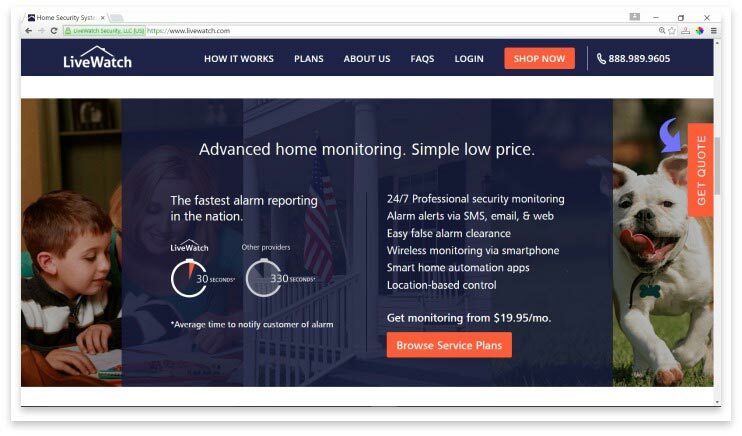 LiveWatch’s reputation is prestigious among security monitoring companies, and disgruntled customers seem to be few and far between. Although some companies claim to have the customer at heart, their services, policies and contracts don’t always reflect this philosophy. LiveWatch however is a whole different story. Thoughtful plans and flexible options make LiveWatch the perfect monitoring system for people who don’t mind installing it themselves. Have you had an experience with this company? Please share your LiveWatch Security reviews below.